For St. Patrick’s this year I used two different greens, OPI Green on the Runway and butterLONDON Dosh, with an accent nail of the opposite color on each hand. I’d planned on just using Dosh as an accent but, once I got it on the nail I loved it so much that I decided to give it a entire hand by itself! And according to my (admittedly small) sample poll, the Dosh hand won… well, handily! So which review am I doing first? Green on the Runway, of course! But first, an aside: (because I never do that…) How much do I love LunchMoney Lewis? A lot! That snappy piano on Bills never fails to make me happy when I hear it. Back to the business at…hand! Can you tell it’s just shy of 5 am and I’m apparently a bit punchy? 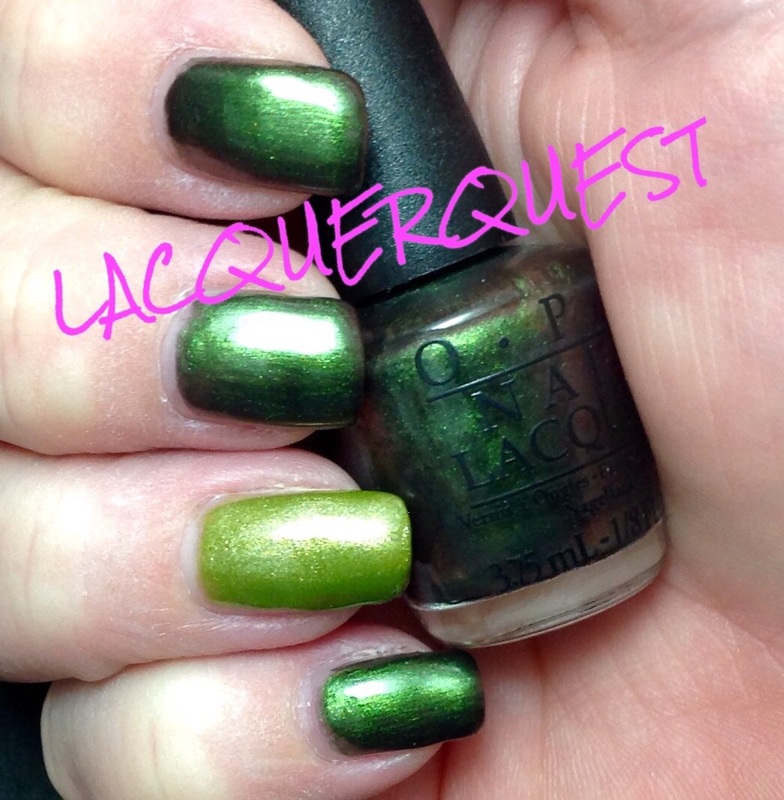 So, Green on the Runway… This was from the Coca-Cola collection put out by OPI last summer. For some reason, neither my Sally or Ulta ever got these in stock. So I ended up getting the mini-set. As luck would have it, instead of putting out a mini-set with the usual four colors, this was a 10 pack with 7 of the 8 colors with a mini top coat and mini Nail Envy. The only one they left out was an orange glitter that I had absolutely no interest in, so I was all over that for under 20 bucks on eBay! Good news, I really liked several of them. Better news, there were none that I was absolutely so crazy about that I just had to have a full size. This one was supposedly inspired by Sprite, but have no idea why. It’s a dark, blackened green duochrome with flashes of brown and maroon. Not Spritely at all. Nicole by OPI is putting out a Coca-Cola collection this year and the Sprite in that one is much closer to the Sprite can. It might already by out, but the only place I ever see NOPI is the grocery store and Wal-mart and I generally don’t scout out the nail polish displays in either of those places. This was three coats and I think I might have been able to get by with two, or at least a thinner coat for the third. Like most duochromes, the first coat was just brown and maroon smears with a hint of green, but it covered really well with the second one. I’m really not a green person, but the blackening gave this a bit more interest. And while reddish-brown is certainly not my first choice for a duochrome flash, all duochromes tend to fascinate me. So, much like it’s inspiration (Sprite), Green on the Runway isn’t my first, second or even third choice and I’ll generally leave it on the shelf, but every once in a while a couple sips of a nice cold one really hits the spot.